Un saludo para mi gente linda al mejor estilo parlache. My brother Juan David has created a tribute to the world’s oldest and most popular alcoholic beverage: Beer. Germany had a very solid first round winning all three games. Ecuador, after having great performances against Poland and Costa Rica played a regular game against Germany. England finished at the top of its group but they didn’t looked unbeatable after the game with Sweden. Sweden improved some from its first game and it’s going to be a tough rival for the Germans. Argentina and Netherlands had very solid performances. They both have great chances of winning their respective 2nd round games. Ivory Coast was unlucky to be in this group. I think they could have made it in another group. This group that seemed really easy for Mexico and Portugal, showed that neither Angola nor Iran were weak teams. Mexico was chosen by FIFA as the top seed of this group, but clearly Portugal was much superior. Both teams have it very difficult in 2nd round against Argentina and Netherlands. This was the most exiting group on the first round. The Czech Republic started with a solid performance and stabilshed themselves as favorites to win the World Cup. But they couldn’t beat either Ghana nor Italy and now they are out of the competition. Ghana on the other hand surprised everyone passing to the next round. They are going to be the only African team left in the competition. Italy made it to the next round but I don’t like their style. Brasil had a slow start beating Croatia 1-0 but they picked up the pace against Australia and Japan winning 2-0 and 4-1 respectively. They have a very difficult game against Ghana in second round. Australia had good games and made it to the second round for the first time in their history. The last game against Croatia was very even but Croatia is out because they couldn’t beat the weakest team in the group Japan. France made it to the second round and had a good game against Togo, but the french squad most likely will loose against Spain. Switzerland was very solid and gave good performances. Now they will be facing Ukraine and this game can go either way. Spain has a great team full of young talent. I mentioned them as strong candidates to win the World Cup and I think they still are. Ukraine which was big dissapointment after the first match with Spain, was able to recover but against the two other teams in the group (Saudia Arabia and Tunisia) which are not strong teams. They could make it to quarter finals if they beat Switzerland but I don’t think they will go any further. In the 2002 World Cup teams from CONCACAF had a great performance while teams from CONMEBOL were a dissapointment. Mexico finished at the top of its group and lost in second round against the USA. The USA made it to quarter finals but lost against Germany. Costa Rica didn’t made it to second round but they finished in third possition in the group with the same number of points (4) as Turkey lossing the second place because of goal difference. As far as CONMEBOL goes Uruguay, Argentina and Ecuador failed to advance to the second round and Paraguay lost against Germany in second round. Brazil obviously was the great exception and won the World Cup. Here are the numbers of that WC. I even remove Brazil to show how bad CONMEBOL did if Brazil wasn’t part of it. I was really dissapointed that Colombia didn’t make it to the 2006 World Cup and I thought that it was unfair that CONCACAF had 3.5 places for its associated nations in the WC and CONMEBOL only had 4.5. I think CONMEBOL should have at least 50% more places than CONCACAF for all its World Cup history (9 World Cup championships). Not only that but the 4th best team from CONCACAF (Trinidad & Tobago) had to play for the half place against the 5th best country in Asia (Baharein), while the 5th best country from CONMEBOL (Uruguay) had to play against the best team in Oceania (Australia). But everytime I brought the subject with my Mexican friends for the past 4 years, they would remind me of how bad CONMEBOL did in the 2002 World Cup and how well CONCACAF is doing. They would argue that the 2 WCs Uruguay won in 1930 and 1950 mean nothing today. They would say that Mexico and the USA have been in the FIFA top 10 ranking for the last few years. I hope the FIFA follows the same logic to decide the number of places for the 2010 World Cup and takes a place from CONCACAF (2.5) and gives it to CONMEBOL (5.5). Dedicated with love to all my Mexican friends. Candidates to win the WC: Brazil, Spain, Czech Republic and Germany. Brazil obviously is everyoneâ€™s favorite, although they didnâ€™t have a great game against Croatia. Spain smashed Ukraine and has a very strong team, with very young players on the attack. The Czechs are not a surprise: theyâ€™ve been playing really well in the past few years and they are ranked #2 by the FIFA. Germany is a candidate because they are playing home. I think that under different conditions, Germany wouldnâ€™t be a favorite. Teams that will make it to quarter finals: England, Argentina, Netherlands and Italy. Everyone knows these are four very strong teams but none had a spectacular first game. But if they improve for the next matches, they are definitely candidates to win the WC. If there is going to be a surprising team this year, it has to come out of this list. These are four very solid and great teams, but not as good as to win the WC. I had a lot of expectations about Ukraine. They were the first European team to qualify to the WC and they didnâ€™t lose a single match during qualifying. And they have Shevchenko one of the best soccer players in the world. However they looked terrible against Spain. They have an easy group with Saudi Arabia and Tunes, so they might recover and make it to the next round. With Sweden I also had high expectations, especially because of their strong attack with Larson and Ibrahimovic, but they couldnâ€™t win the game against Trinidad & Tobago. I do recognize that T&T played an amazing game but I though that Sweden will be beating them easily. Finally USA, Paraguay and France played a terrible first game. I donâ€™t think USA has a chance to advance to the next round since they are in one of the toughest groups. Paraguay doesnâ€™t seem to have strong team. They played horrible against England. I think France on the other hand can put it together and make it to the next round, since their group is not too difficult. 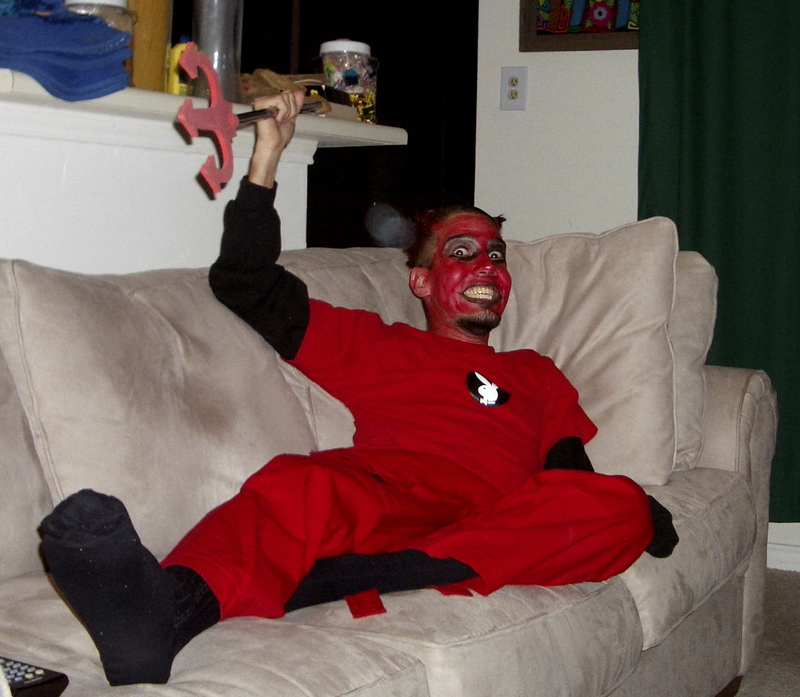 My devil picture has been very popular lately on Google Images! This past weekend I went to Monterrey, Mexico with Marcos and Eva. We stayed for 4 days and we did lots of cultural activities including seeing a live concert of Gustavo Cerati, a performance by the argentinian group De La Guarda, visiting the Marco museum which had an exhibit of Ricardo Legorreta and the Museum of Mexican History, and going to the top of the ‘Obispado‘ where a huge mexican flag hangs. Cerati’s concert was amazing. He played the entire new album (AhÃ­ Vamos), some other songs from previous records and four songs from his former group Soda Stereo. Marcos posted the list of songs in his blog. The performance by De La Guarda was a really pleasant surprise. I wasn’t really exited about going to the show, but I must say that I enjoyed it a lot. The show is like a mix of a theater play with a rave with a circus with a concert with the extra ingredient that the audience gets fully involved in the show. I don’t want to say much about the show because I think you should see it if you ever have a chance and I don’t want to spoil it for you giving lots of details. Moi Kirsch took a wonderful 360 picture of Monterrey from the obispado. I have to thank Marco’s family Aaron, Thelma and Moises for their awesome hospitality. And I have to thank David (from the restaurant ‘CafÃ© Oasis’ located around Km 160 in the road Nuevo Laredo – Monterrey), Fernando (from the Hotel El Rancho located around Km 90) and Amador Garza (Director de Seguridad PÃºblica Municipal of Vallecillo, Nuevo LeÃ³n). They helped me recovering my immigration documents which I forgot at the Oasis Cafe when we made a quick stop there.